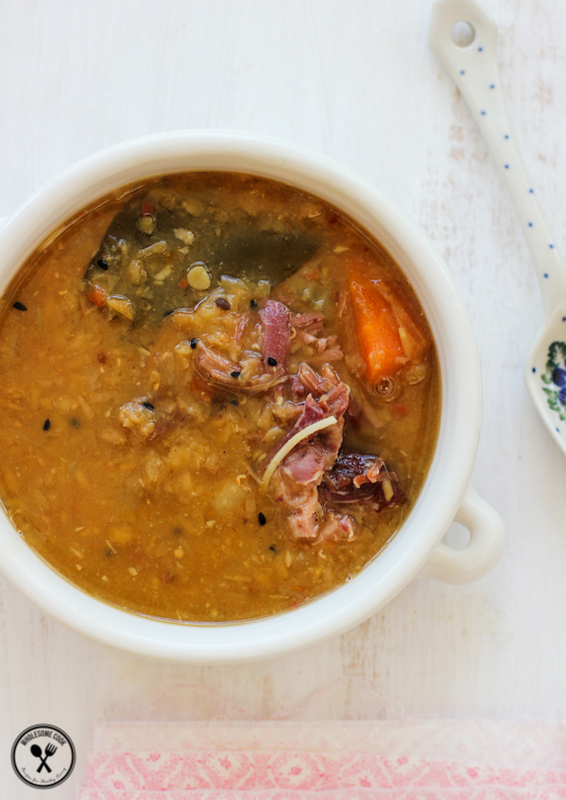 (As Featured in Jul.2014 Nourish Magazine) Fragrant with kaffir lime leaves, chilli and shredded coconut, this Lentil Coconut and Ham Hock Soup, makes for a more summery rendition of the traditional winter comfort dish. If you are keeping your leftover Christmas ham bone in the freezer to use later, this might just be the recipe to try. I am almost absurdly proud of the fact that I baked my first leg of ham last Christmas. I’m thirty-something and for someone who has been cooking most of her life, it’s quite surprising that I hadn’t attempted it before. Perhaps the sheer magnitude of leftovers scared me a little from trying? Nevertheless, I glazed the leg of ham using a half-half mixture of the pineapple and mustard glazes, baked it and carved it. It was spot on: juicy and tender and utterly scrummy. Leftovers, and there were indeed plenty, were turned into cheesy mustard toasties, fried rice, served instead of bacon with eggs, and eaten with a side of grated salad, mustard slaw or steamed greens for lunch. I kept the leftovers still on the bone under good wraps. I read somewhere that wrapping ham in a Chux soaked in a vinegar and water solution keeps the meat from going off, slimy and green. I can’t now recall where exactly I read this tip or what the ratio is – I went with half vinegar to half water, changing the “dressing”every four or so days. For extra protection I double wrapped it into a ham bag as well and it kept for over 3 weeks! I’m pretty sure it would have lasted another week. Not wanting to throw out the beautifully smoked ham hock that still had some meat on it, but in slightly less accessible places, I started off by making ham hock and veg stock. This gave me time to figure out how I was going to use it. I thought about making a ham and corn soup or using the ham stock as a base for a creamy and garlicky seafood chowder. It was a hot day, but for some reason lentils, flavoured with coconut, chilli and kaffir lime, began to sound perfect. (That’s the great thing about induction stove top and cast iron cookware – it gives off no heat during cooking, fantastic for stove-top slow-cooking in summer). After a couple of hours on the stove (or indeed in a crock pot or slow cooker), the meat starts to fall off the bone, and the tendons and fat melt into the stock to lend it an incredibly sweet flavour. If you are keeping your leftover Christmas ham bone in the freezer to use later, this might just be the recipe to try. 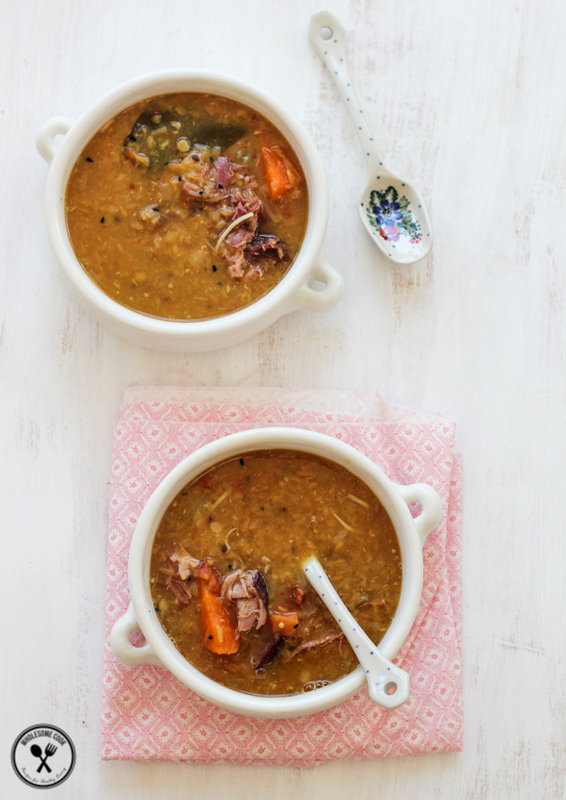 A fragrant twist on the classic pea and ham soup, made with nutritious red lentils, fragrant coconut, kaffir lime leaves and smoked ham stock. In terms of procuring a ham hock (leg ham bone) you can ask your butcher or supermarket cold cut counter if they have and could hold a free-range ham bone for you. Heat 2 tablespoons coconut oil in a large cast iron (lidded) casserole dish (or crock pot / slow cooker) over medium heat. Add leek, carrot and celery sticks. Cook for a minute until the leek starts to become translucent. Add remaining coconut oil, kafir lime leaves, sliced chilli, lemongrass and spices and continue to cook, stirring, for another minute for them to become fragrant. Add ham hock, water and the stock cube to the pan. Bring to a boil then reduce heat to medium low, cover with a lid and cook for 2 hours to infuse the stock. (If saving the stock for later, strain it and freeze. You can leave the vegetables and ham meat picked off the bone in if you like also). 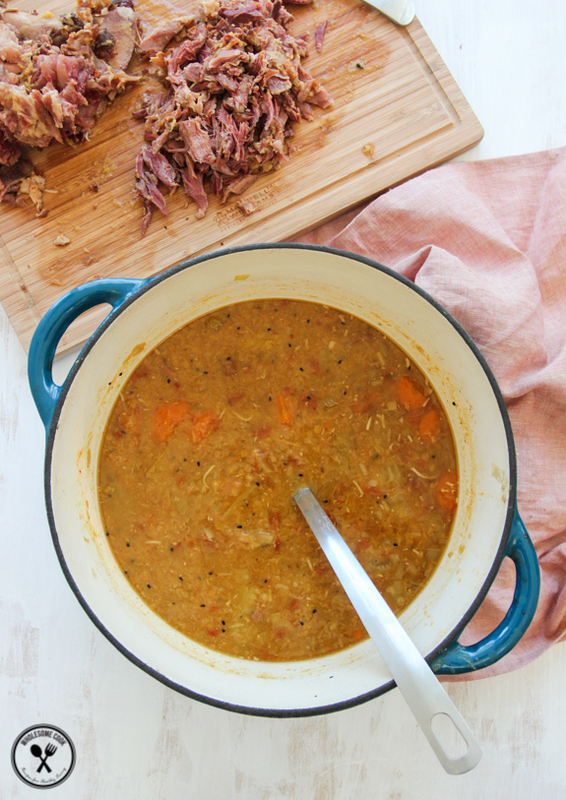 With the stock still on the stove and the ham hock in, add lentils, sesame seeds and shredded coconut to the pot. Stir, cover with a lid and cook for a further 30-45 minutes, stirring occasionally to prevent the lentils from burning to the bottom. Once ready, remove the ham hock from the pot and pick off the meat - it should be tender and falling off the bone. Return the meat into the pot, stir, and serve. Any remaining soup will freeze well. Yuuuuuuum! I’ve been waiting for this one since your instagram photo. Will be defrosting ham bone on the weekend to try this recipe. Soudns amazing! Thanks for the tip on asking a butcher for a ham bone. I would have never thought to do that. The soup sounds like a must try. Printing the recipe as I type. I’ve never ever put coconut in soup but I’m DYING to try this. I made pea and ham soup with my Christmas ham bone. I wish I’d left it in the freezer longer and waited for this! What a wonderful fusion this sounds to be! 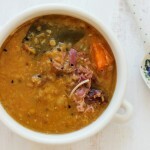 Ham and lentil soup ~ of course! But all these Pacific and Asian flavours added – shall buy a ham hock as soon as possible after temps fall just a tad and am certain to provide culinary pleasure to some friends around . . . I hadn’t baked a ham either this this Christmas! Sadly, I had no ham left over for the plethora of great meals I was going to make. Wonderful recipe. Looks fabulous. I’m 30 as of last year and I’ve not baked a ham before yet! Ooops!